STOCKHOLM -- News of Bob Dylan’s Nobel honor has had mixed reactions. U.S. President Barack Obama has offered his congratulations to Bob Dylan for being awarded the Nobel Prize in literature. There is no musical artist on this earth that merits a #NobelPrize more than Bob Dylan. His poetry and melody changed society. 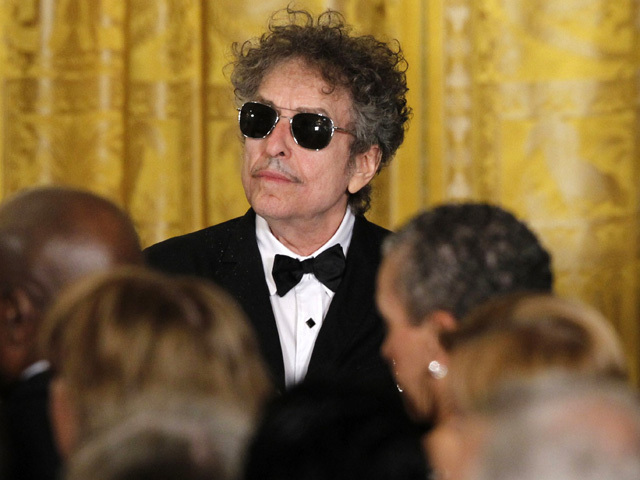 Bob Dylan is a great choice for the Nobel Prize. One result might be to open the prize to genre fiction as well as the 'literary' sort. British Indian novelist Salman Rushdie, often mentioned as a possible Nobel literature prize contender, has lauded the choice to honor singer-songwriter Bob Dylan with this year’s award. Not everyone sang Dylan’s praises, however. Scottish novelist Irvine Welsh reacted angrily to the awarding of the Nobel Prize for literature to Bob Dylan, embarking on a series of exchanges on Twitter. “I’m a Dylan fan, but this is an ill conceived nostalgia award wrenched from the rancid prostates of senile, gibbering hippies,” the “Trainspotting” author wrote. He also begged to know if writer Don De Lillo had been inducted into the Rock ‘n’ Roll hall of fame yet. The Vatican newspaper is another critic, saying that while some of Bob Dylan’s lyrics are beautiful, he’s just a songwriter and that “real” writers who know what it takes to produce a book might not be happy with this year’s choice for the Nobel Prize in Literature. L’Osservatore Romano, which frequently chimes in on pop culture, wrote a brief article about Thursday’s award. The paper did praise Dylan for having steered clear of all the trappings of celebrity culture, saying he followed “an invitation to not conform, and think with his own mind.”Author Gary Shteyngart also lampooned the decision, though not by specifically calling out Dylan but by criticizing the Nobel committee instead. “I totally get the Nobel committee. Reading books is hard,” he tweeted. Author Jodi Picoult, on the other hand, saw the move as a new personal opportunity. But the naysayers seemed to be in the minority, as most cheered the news, with much more complimentary messages about the honor, though. British Indian novelist Salman Rushdie, often mentioned as a possible Nobel literature prize contender, lauded the choice to honor Dylan with this year’s award. “From Orpheus to Faiz, song & poetry have been closely linked. Dylan is the brilliant inheritor of the bardic tradition. Great choice,” Rushdie tweeted. And Chilean President Michelle Bachelet was quick to congratulate Dylan on the award. “What a joy that Bob Dylan got the Nobel for literature. Many fond memories from my adolescence are associated with his music,” she tweeted. ¡Qué alegría el premio Nobel de Literatura para Bob Dylan! Muchos y gratos recuerdos de mi adolescencia están asociados a su música.